The ground floor detailing at the project is very similar to that at the Denby Dale Passivhaus, with a few notable tweaks…. We did look into using a floating / completely thermal bridge free ground floor/ wall junction. This would have involved building the concrete blockwork inner leaf and ground floor slab off the underfloor insulation and not needing to take the insulation in the cavity down to the foundation strip. However, the loading on the inner leaf (which additionally carries the intermediate floor and roof) would have been so great that we would have had to upgrade the insulation in terms of compressive strength. This would have a) put the price up and b) lowered the lamda/ U value of the underfloor insulation. As at Denby Dale, we’re using the Celcon low thermal conductivity blocks again in the inner leaf below the groundfloor slab to reduce the path of the thermal bridge down to the strip foundations. 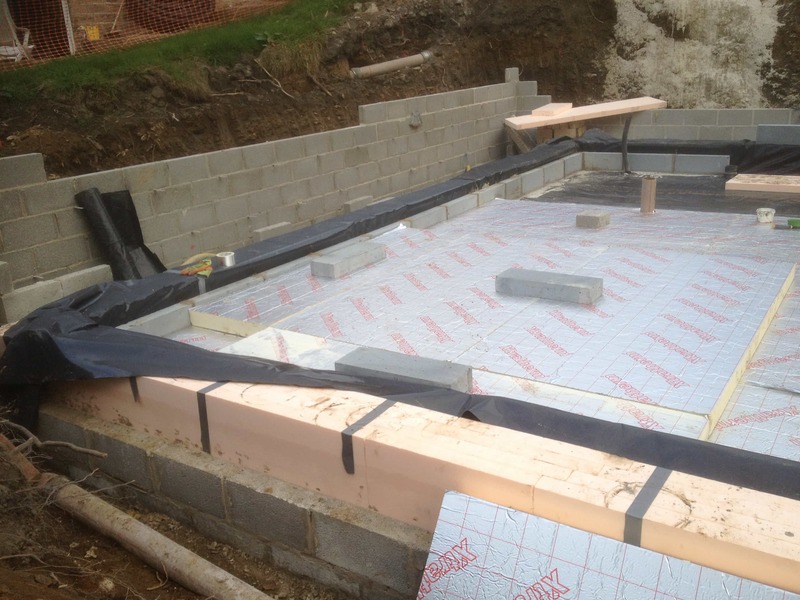 But this time, learning lessons from Steel Farm (Mark Siddall from LEAP Architecture’s cavity wall Passivhaus project) we have taken the damp proof membrane around the first course of Celcon block below the groundfloor slab, which means it will stay dry and maintain its lamda value. We’ve then dressed the damp proof membrane up within the cavity and back into the inner DPC. At Denby Dale we don’t think it is a real problem, as it was a very dry site, but this is a ‘belt and braces’ approach that Mark Siddall introduced us to. We have also changed the type of polystyrene we’re using in the cavity, below the cavity tray down to the foundation strip. We have discovered that extruded polystyrene is more water repellent than the expanded polystyrene we used at Denby Dale. So, for the Golcar Passivhaus we’ve decided to use Knauf Polyfoam extruded polystyrene to minimise the risk of moisture affecting the thermal performance of insulation. For the underfloor insulation in the slab itself, we’ve used 200mm polyurethane under the slab because of its better lamda values. (0.022). 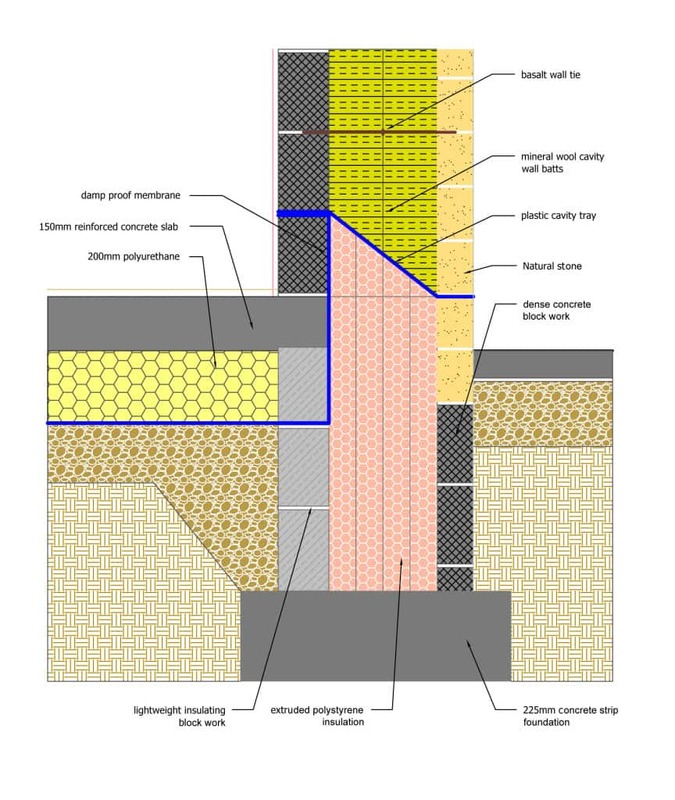 The next blog will look at window & door thresholds and positioning within the insulation to minimise thermal bridging..
Can extruded polystyrene insulation be added along inside face of insulating block below floor slab down to foundation strip to minimise thermal bridge at floor insulation and inside leaf interface? The simple answer is yes, but our Therm calculations show a ‘thermal bridge free’ junction without. As a general comment, we obviously want to keep costs to the minimum. There is always a danger of over engineering/specifying. Passivhaus is designed around the 15Kw/m2/annum for comfort and economic reasons. There is a diminishing economic return on going below the 15Kw benchmark. The key here is accurate PHPP and Therm calculations which gives the designer confidence not to over engineer.